With all of the concern about climate change, it is important that we step back to examine the college’s role in trying to achieve some level of sustainability while coming to terms with a common understanding of what sustainability means. In a general sense, sustainability, the capacity to maintain a certain process or state indefinitely, has come to encompass the larger issue of the impact generated by our activities as a community, and individually, on the world as a whole. At the forefront of those activities is the use of fossil fuel. The clamor surrounding the extraction and use of fossil fuels obscures the uncomfortable truth that there are few alternatives that possess the concentrated energy found in a gallon of oil or a cubic foot of natural gas. These fuels are important feedstocks for everything from plastics, to textiles, to fertilizers as well as the primary fuel for transportation, heating and electricity. Without these fuels, we could not have built the world we live in today nor produce the goods that we have come to view as essential. In short, without them we would be living in a much different world; I would venture to say a much-diminished world. The argument that we can do without fossil fuels immediately, or even in the near future, has to be accompanied by a list of the items we are willing to give up to keep that fuel in the ground. Putting aside for the moment the goal of a fossil fuel-free world, the impact of carbon in the atmosphere is an immediate and critical issue. Clearly, burning fossil fuels is a primary source of produced carbon and the college has to lay claim to a portion of it both directly and indirectly. As an institution there is no escaping the fact that we are a carbon contributor and have the potential to mitigate climate impact by the choices we make as a college. It might interest people to know that the college, and in fact much of the town, burned coal for heat and cooking up until around the Second World War. The heat plant itself was originally an electric power plant that replaced what we think might have been a coal gas plant that provided illumination gas prior to the invention of the light bulb. The underground steam system that the heat plant supports has been in place since the 1920s, when a tunnel was dug and the first pipes were laid up to Parrish Hall. That system was gradually expanded to other buildings as they were constructed and the heat plant was converted to burn heavy fuel oil (#6 fuel oil) in place of coal in the 1950s, followed by another conversion, when the boilers were replaced in the 1970s to enable them to also burn natural gas. Today, that steam system supports heat and domestic hot water in 1,130,000 square feet of campus structures, and the plant has been converted to burn natural gas as the primary fuel, using light oil (#2 fuel oil) as the back-up fuel. The decision about what fuel we use is an important one, as fuels account for a little over a third of the college’s greenhouse gas emissions. One of the drivers for the conversion to a lighter fuel oil was that the calculated carbon equivalent (COe) emissions in the years we burned heavy fuel was exponentially higher than the years we burned natural gas. Light oil is not as clean-burning as natural gas but emits far less sulfur, ash and other pollutants than the heavy oil. The cleanest burning fuel is natural gas and it is our fuel of choice. However, even the cleanest-burning fuel in an inefficient system is a poor use of resources. That’s where we are today. Producing steam is an excellent way to get large volumes of latent heat through a relatively small pipe to remote locations. The downside is that producing steam requires a prodigious amount of fuel to turn a pound of water (about a pint) into steam vapor. Basically, to turn a pound of water from 32 degrees Fahrenheit steam vapor takes 1150 Btus at atmospheric pressure and even more Btus as the pressure builds. To get a sense of scale, each of the two boilers we use is rated for the ability to evaporate 13,800 pounds of water an hour using 120+ gallons per hour of oil. 16.7 million kilojoules of energy are needed per boiler per hour at a minimum. A heat plant producing steam was an excellent choice in the last century. It let the college purchase coal fuel in bulk and store it in one location, and it avoided the need to schlep that fuel to individual boilers in each building. The fire tenders — coal fires had to be monitored 24-7 — could stay in one place. When the campus evolved and left coal behind, it became less clear that the steam system was the best way to provide heat to the buildings. As buildings were renovated, direct steam radiators were replaced with hydronic fin tube, fan coil and air handling units which were supplied with hot water to provide the heat. 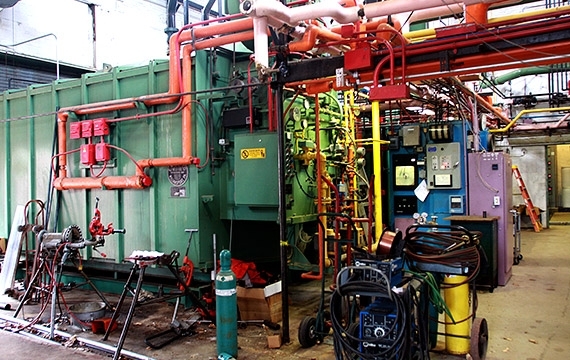 From an operational standpoint, we are boiling water at the heat plant, sending steam up through thousands of feet of pipe — hundreds of valves and dozens of pressure reducing stations — to converters at the buildings which take the heat from the steam, transfer it to the water of the hydronic systems and ultimately provides the heat and hot water to the buildings. It is a long journey that is only completed when the condensate from the steam is pumped back to the plant and collected to be cycled through the boilers again. At every stage of the steam supply system, we are losing heat. A lot of energy is expended just to keep the system pressurized in the event that heat is called for. We still have the advantage of bulk fuel purchase (even natural gas can be purchased in bulk) but we are losing energy efficiency. Efficiency is not just a measure of dollars and Btus. It is now representative of carbon emissions. If the college is going to reach the goal of carbon neutrality, we have to rethink not only what temperatures are bearable but how we move heat in the most efficient way.